What grows? What does not? can a stool grow and...become a chair? Think, then answer—yes or no. A duckling grows and becomes a duck, so can a car grow into a truck? This beguiling book about growth will spark kids' imaginations, as unfolding flaps playfully transform a watch into a clock and a shovel into a plow. The interactive format of question and answer will entrance young readers as living things that grow are compared to inanimate objects that don't. Ingenious! 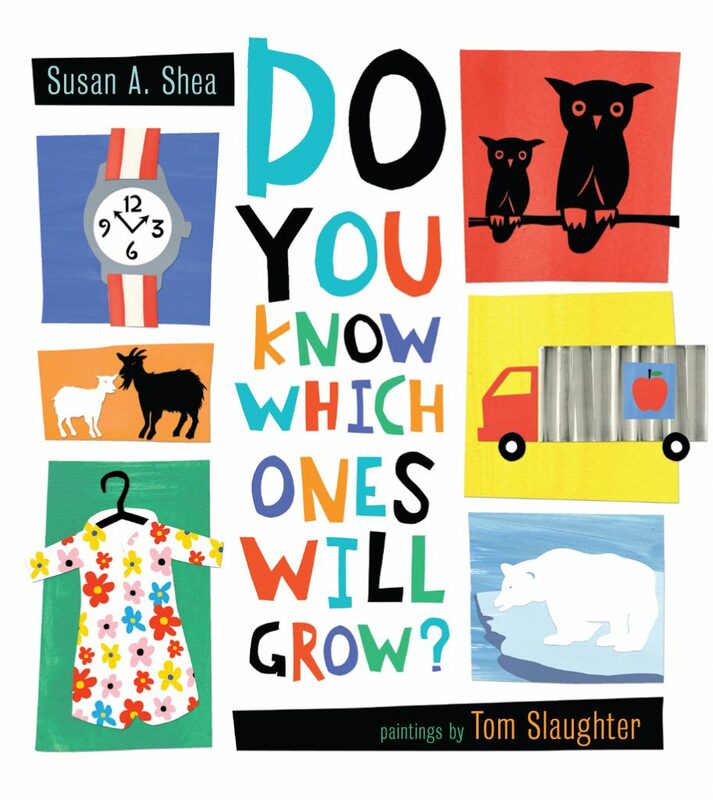 ★ Shea’s children’s-book debut is a clever, rhymed test of kids’ notions of living and nonliving things that's great for both lap and group sharing. “If you look around you’ll see, / Some things grow, like you and me… / Do you know which ones will grow? 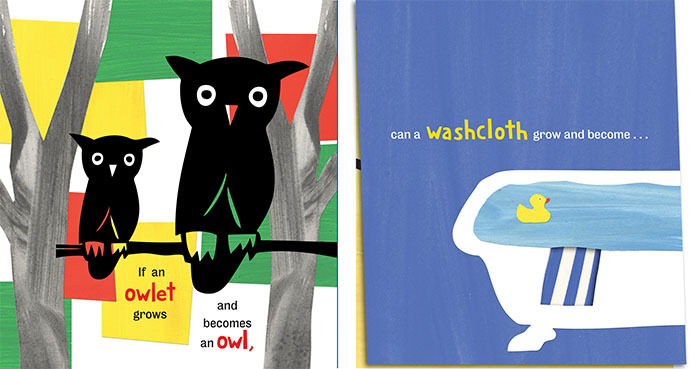 / Think, then answer yes or no.” What follows is a terrific interplay of rhyming questions and cunningly designed gatefold illustrations: “If a calf grows and becomes a cow, / can a shovel grow and become…/ a plow?” The left side pictures the cows, while the right-hand page shows a huge shovel and pail. A flip of the fold reveals the corner of the shovel becoming a part of a truck-mounted plow. Other rhymes include duck and truck, bear and chair, cat and hat, goat and coat, towel and owl, snake and cake, pig and rig, fox and clock and kangaroo and you. The final two pages summarize the answers, still keeping the rhythm and rhyme. Slaughter’s illustrations bring pop art to mind: vivid reds, blues, yellows and greens, few details, simple backgrounds and blocks of color. Many of the objects are cut-paper silhouettes against a painted background. Between its allure as an audience-participation read-aloud and its numerous classroom uses (living/nonliving, analogies, rhymes, spelling rules, baby animal names, creative thinking…) clear a space on the shelves for this one, even though it may never be there for long. Slaughter’s brightly colored cut-paper shapes and newcomer Shea’s verse recall favorites of 50 years ago—a feeling reinforced by this book’s matte pages, blocky images, and fun-to-flip gatefolds. “If a duckling grows/ and becomes a duck,/ can a car grow and become...” reads the text on facing pages; children will be able to guess what’s coming even before the gatefold opens—“a truck?” Slaughter (Which Way?) revels in paint-box primaries, pushing reds, greens, yellows, and blues up against each other for maximum visual charge. The gatefolds break in interesting places—halfway down a garment hanging on a hanger, for example, turning a floral sweater into a full-length coat—and contain the occasional die-cut, too. Shea’s verses scan consistently and gracefully. “YES to ducks, bears, and owls./ NO to trucks, chairs, and towels,” she writes, reinforcing the idea that living things grow but inanimate objects don’t. The beauty of the rhymes is that they teach a lesson children already know; children will relish the fun of being sure of all the answers, and they’ll love Shea’s tongue-incheek tone.